Tomato diseases can be a gardener's nightmare. Tomatoes have few pests–other than deer and the tomato hornworm–but they have many diseases. Drought, sustained high temperatures, and heavy fruiting can stress tomatoes, making them more vulnerable to fungal diseases like fusarium wilt, verticilium wilt, and blights. Water that lingers on leaves can become the site for fungi to attack leaves. Tomatoes are also subject to viral diseases like Tobacco Mosaic Virus (TMV) and Western Yellows (Beet Curly Top). In California, Western Yellows can infect tomatoes early in the season, but not show up until the plants start fruiting. The disease stunts the plants and stops fruit production entirely. Unfortunately, I don't have good photos of tomato diseases, other than Western Yellows. As both a gardener and a photographer, I don't do ugly very well, and diseased tomato plants are ugly. I've had problems with fusarium wilt, verticilium wilt, and late blight in the past, but brown is the color of failure in the garden, so I didn't take pictures. I figured out what the problem was and how to correct or avoid it, and then moved on. Luckily, university extension services have lots of ugly photos of tomato diseases. Most of the images below (except for Western Yellows) come from various agricultural extension service publications. Wherever I've used a photo, I link to the publication it came from. For each tomato disease, I reviewed several publications, and link to the one with the clearest photos or the most concise descriptions of the disease. It can be hard to distinguish one tomato disease from another, especially if a symptom is "yellow leaves" or "wilting". This is why photos are so useful. But while identifying the disease that's hitting your plants is important, most tomato diseases are fungal diseases, and the organic approach to preventing and treating fungal diseases of tomatoes is the same. Measures taken against one disease work against others as well. 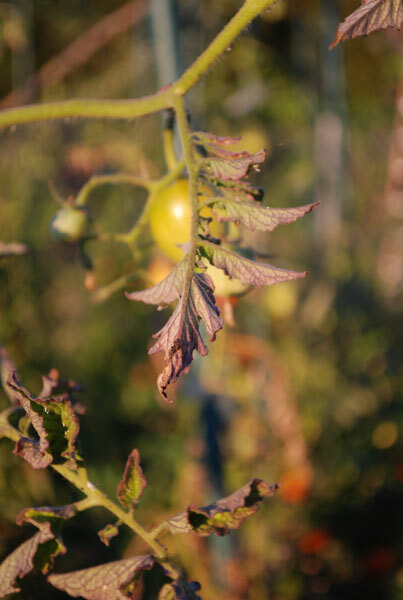 Most extension services recommend chemical fungicides as solutions, so be sure to check What to Do About Tomato Diseases for organic solutions. Fusarium Wilt and Verticilium Wilt are common tomato diseases that have been the bane of gardeners for generations. These fungi are soil-bourne, they enter through the roots and attack the vascular tissues that transport nutrients from the roots to the leaves and fruit. Nutrient flow slows and eventually stops, stunting then killing the plant. Unfortunately, spores can remain in infected soil for years. In both of these diseases, symptoms may not be severe until the plants start setting fruit, and the plant's energy is diverted to fruit and seed production. Symptoms can appear to be similar, and it's sometimes difficult to distinguish Fusarium wilt from Verticilium wilt, especially early in the disease. Fusarium wilt is characterized by a generalized wilting of the plant that becomes more pronounced after fruit set. Early in the disease you may see the chararcteristic "shepherd's crook" wilting at the top of the plant (see photo at the top of this section), along with lesions on the lower leaves. Lower leaves yellow and drop off the plant. Verticilium Wilt is a common tomato disease in much of the country. Symptoms begin with a slight wilting at the top of the plant during the heat of the day. Older leaves yellow and drop. Some leaves yellow at the margins in a characteristic "V" pattern. Eventually, the crown of the plant loses all its leaves, and the remaining leaves curl upward before dropping. Fruit set is skimpy, and the tomatoes are small and of low quality. Early Blight is a fungal tomato disease that's common on the east coast and in the midwest, but is only seen occasionally on the west coast. It thrives on wet leaves and high humidity. When conditions are right, it can spread alarmingly fast. Symptoms begin early in the season as small, irregular brown patches with a yellow halo on the leaves, often affecting lower and interior leaves that stay wet after rain. Lesions often have a characteristic bullseye pattern As with most tomato diseases, the disease accelerates when the plant sets fruit. Hot days and high humidity favor the disease, and may kill off most of the leaves, exposing the fruit to sunscald. You can find photos of Early Blight and more information in this The Ontario Ministry of Agriculture Food and Rural Affairs Crop IPM Web Site . 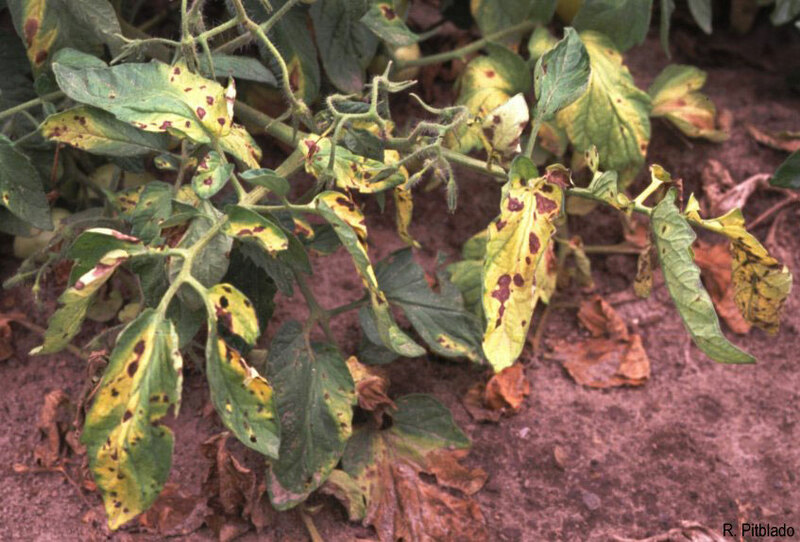 Late Blight is a common tomato disease on the east coast and in the Pacific Northwest. It starts as irregular, dark spots on lower leaves. Stems may darken and develop fuzzy, white patches. The undersides of leaves may develop a white, fuzzy growth of fungus that can envelop the whole plant if it's hot and humid. Late blight can also affect fruit, usually on the upper half. Infected fruit has a grey-green spot and becomes hard and pithy. Cornell has by far the best photos of late blight I've seen. Septoria Leaf Spot is another fungal disease that attacks tomato leaves, especially the lower leaves of plants. Like many other tomato leaf diseases, it requires wet leaves for spores to germinate, so avoiding overhead watering can help prevent the disease. A thick layer of mulch can also help. Root Knot is caused by root-knot nematodes. These nearly invisible worms attack the roots of the plants, forming ulcers and galls that destroy the plant's ability to draw moisture and nutrients from the soil. Infected plants are stunted, may have a yellowish cast to all their leaves (as opposed to just the bottom leaves), and wilt easily on hot days. The classic organic solution to root-knot nematodes is to interplant marigolds between tomatoes, or plant tomatoes where marigolds were grown the summer before. 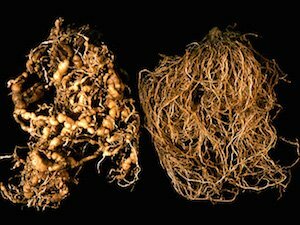 Root exudates from marigolds repel nematodes. Where summers are long and warm, you can also amend the soil with shrimp meal or crab meal. Shrimp and crab shells contain a lot of chitin, and adding them to the soil causes populations of chitin-eating bacteria to rise. After a few months, these bacteria use up the chitin from the shrimp or crab shells. Then they attack the next highest source of chitin in the soil: nematodes. This only works where summers are long and the soil temperatures remain high for several months. But if you live in a long-summer area where root knot nematodes are a big problem in the fall, try adding some shrimp or crab meal to your soil when you plant your tomatoes. The University of Maryland Extension Service has an excellent publication on root-knot nematodes . Western Yellows is one of the few tomato diseases I took pictures of. An infected plant will hum along nicely, growing as fast as un-infected neighbors, but as soon as they start setting fruit, the leaves start twisting under and getting leathery, the plant stops flowering, and it stops growing entirely. 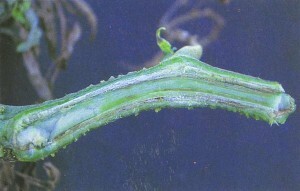 Infected plants are stunted, with thick, leathery, yellow leaves that twist up and under, and may have raised purple veins. Western yellows is a viral disease that's transmitted by leaf hoppers–the adult form of the "spittlebugs" you often see on plant stalks in the spring. Tomatoes are not the prefered host for these insects, but they'll attack anything that's growing in the early summer. Solution: Leaf hoppers move into cultivated areas from adjacent fields and weedy areas, so the best control is to keep weeds in check near tomato plots. Once you know you're dealing with western yellows, yank the plant and dispose of it in the trash. Tobacco Mosaic Virus (TMV): is a virus that attacks tomatoes, eggplants, peppers, cucurbits, and a wide range of other plants. It causes dark, puckered patches on tomato leaves, and produces stunted plants and mottled, pithy fruit. Tobacco Mosaic Virus is endemic in tobacco-growing areas, and can easily be transmitted by smokers who handle tomato plants. If you smoke, don't smoke in the garden, and make sure you wash your hands thoroughly before working in the garden. The University of Florida Extension Service has a good photo of Tobacco Mosaic Virus (TMV) in leaves and fruit . The organic approach to tomato diseases can be summarized in one word: Prevention. Most of the diseases that affect tomatoes are fungal diseases. There are a lot of steps that can be taken to make life difficult for disease-causing fungi, but once a tomato disease has taken hold, there may not be much you can do to save the plant. If you smoke, don't smoke in the garden and wash your hands before handling plants. If you haven't read these guidelines, do check them out–they can help prevent a wide range of vegetable diseases, not just tomato diseases. Some of these guidelines are more important than others with regard to tomato diseases, and should be highlighted. By far the most effective strategy for preventing tomato diseases is to plant resistant varieties. Plant breeders have been fighting tomato diseases for decades, and many tomato varieties have strong or partial resistance to one or more tomato diseases. Resistant tomato varieties are labeled "VFN", for varieties resistant to verticillium wilt, fusarium wilt, and root-knot nematode, or "VFN TMV" for varieties resistant to those three diseases plus tobacco mosaic virus. 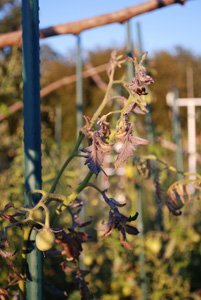 Some tomato varieties may have resistance to early and late blights, as well. Resistant varieties still get the disease, they just don't get it as severely, and they're still able to produce fruit in spite of the disease. Tomato diseases overwinter in plant debris left in the field, so garden sanitation and crop rotation are critical to preventing plant diseases of all kinds. Always remove diseased tomato vines from the garden, and dispose of them in the trash. If you leave them in the field, they'll just fuel next year's outbreak. And while a hot compost pile will kill disease spores, all the diseased tissue needs to be in the hottest core of the pile. Anything outside that hot core may survive and infect next year's plants, so it's best to throw away diseased tomato plants. Mulching is also a neglected, but effective, way of preventing tomato diseases, especially foliar diseases like early blight, late blight, and septoria leaf spot. Many of these diseases result when spores splash onto the lower leaves from hard rains hitting the ground. A thick layer of mulch can prevent infection by splashing. Pests and diseases key in on weakened or stressed plants. Plant vigour is one of the best defenses against tomato diseases. Strong, vigourous plants are less likely to catch diseases, and more likely to still produce a crop if they do catch a disease. Make sure your tomatoes have what they need to thrive. Organic soil amendments like kelp meal can help boost immunity, and rock dust can provide trace minerals that make plants more resilient in very hot weather. Growing Tomatoes for information on soil amendments and preparation to grow vigourous plants like this. Actinovate is an OMRI-approved organic fungicide that employs Streptomyces lydicaans, a bacterial strain that vigorously attacks fungal pathogens on leaves and in soil. You can use a soil drench at the beginning of the season to knock back verticillium and fusarium wilt, and foliar sprays when the first flowers set for fungi that attack leaves, like late blight, early blight, and septoria leaf spot. Soil Solarization is another option for dealing with infected soil. Fusarium and Verticilium wilts can survive for many years in soil. This is why long crop rotations of 4-5 years are required to prevent them in susceptible plants. If you don't have the space for such long rotations, solarization is an option. To solarize a bed, till the soil in early summer to loosen it, water thoroughly, and cover with clear plastic, weighed down at the edges by rocks. Allow the bed to sit this way for 8 weeks. Heat builds up under the plastic, sterilizing the top few inches of soil. After 8 weeks, remove the plastic, till the bed, and plant. It's best to avoid tomatoes, peppers, and eggplants in that bed for the remainder of the season.